Hi there, Guys! I’m popping in with a free Valentine’s Day printable that I made last night, and I think the little people in your lives will love them! And I’m pretty sure that they’ll make all of you happy too, because they’re incredibly quick to put together, and best of all, they’re cheap! I hope your Tuesday is going well. It seems so strange that today’s Tuesday! The girls had Friday, as well as yesterday off, because of the two snowstorms that hit here in Massachusetts over the last few days, and I’m just all out of sorts. It was pretty nice to have a four day weekend though. Who can complain about that? We did a lot of baking and movie watching, and finished Aubrey’s 100th day project… But you know what I didn’t get around to making? 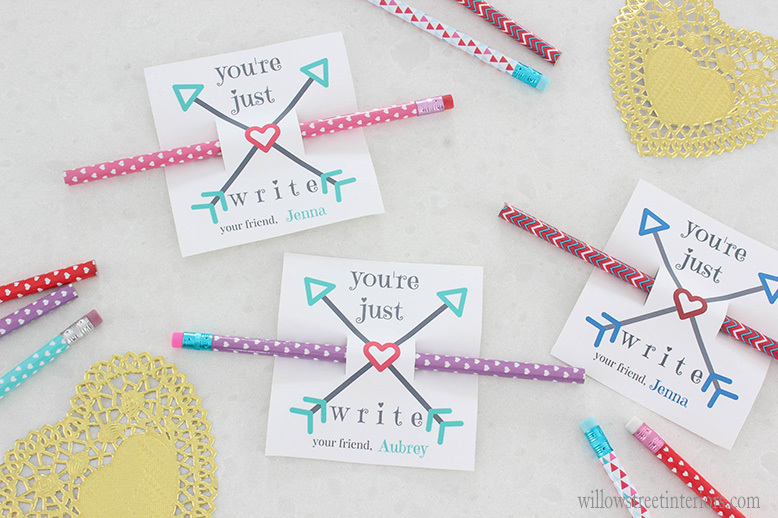 These printables! 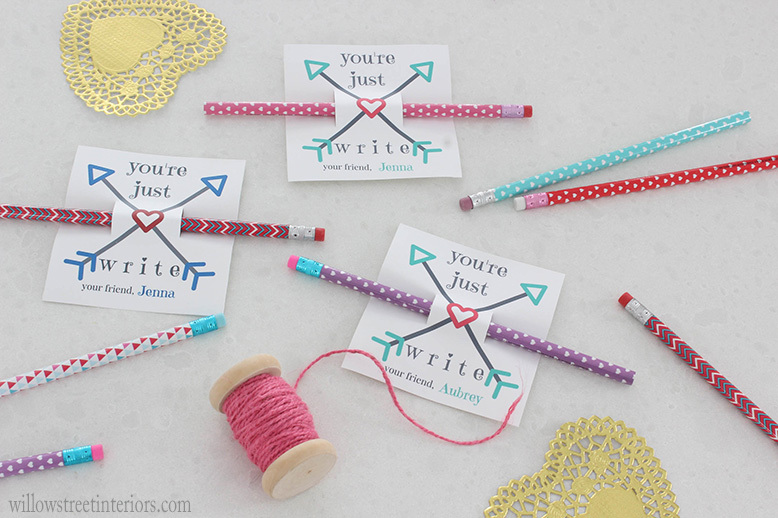 But the good news is, if any of you are kind of last minute with figuring out what to do about your kiddos’ valentines this year, these are perfect. 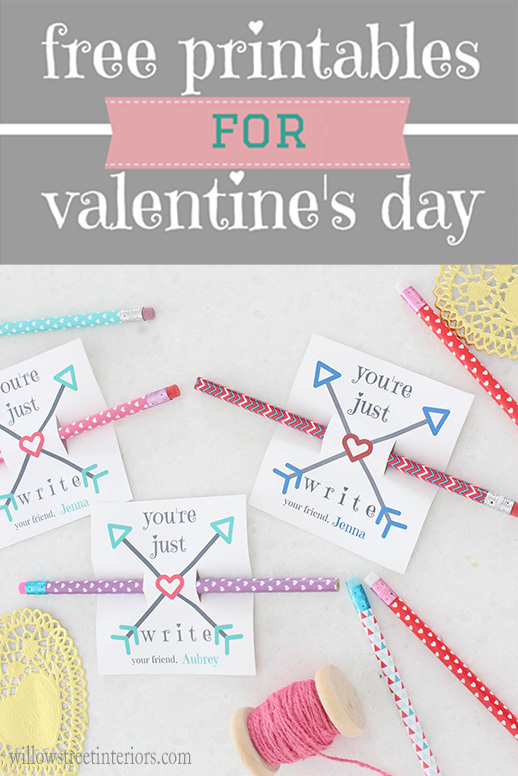 And all you’re going to need is a printer, a few sheets of cardstock or thick printer paper, scissors, and a couple packs of Valentine’s Day pencils! My mom picked these ones up for my girls at Target last week, and they ended up looking so sweet! I’d never heard of it before, but based on her description, I had a feeling that my OCD, crafting loving self was going to be a big fan – and I am. 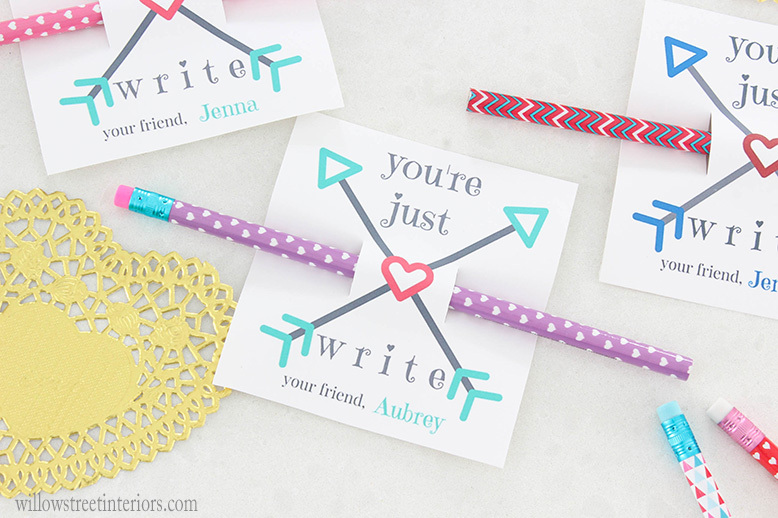 If you’re into creating your own graphics, I’m pretty sure you’ll love it too! That’s what I ended up using to create these, and I think they look pretty darn sweet. Best of all, once I finished the actual design process, they took fifteen minutes to put together for both Jenna and Aubrey’s classes! I hope they’ll make your lives a little easier this week! Have an amazing week, Everyone, and Happy Valentine’s Day! Thank you, Laura! These are adorable!